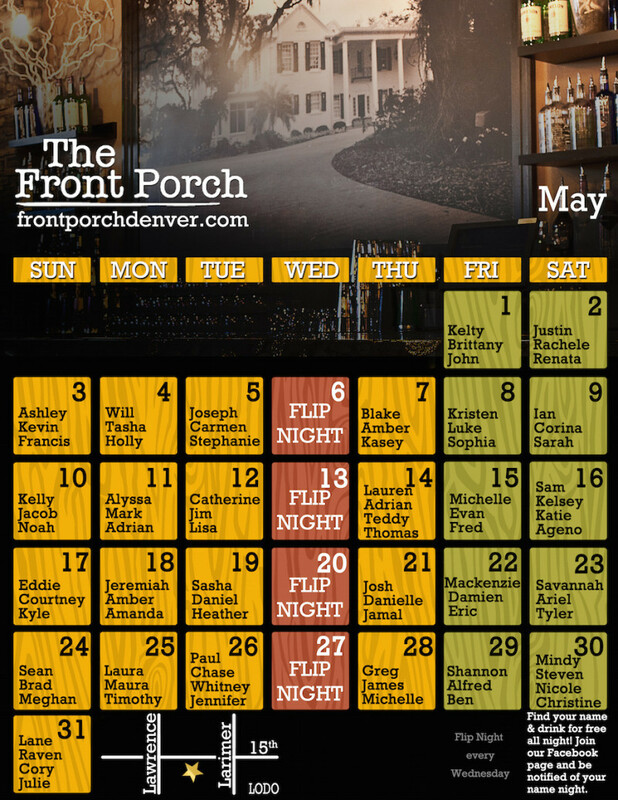 The 5th month of 2015 is here and as usual, it comes loaded with the names of happy Front Porch customers that are going to drink free on the night that their name shows on our Monthly Calend ar. So if your name is Will, Ashley, Kelly, Laura or any other name appearing on our drink free calendar, grab the phone and call some friends, because a fun night full of free drinks and action is waiting for you! Our Name Nights are from Monday to Sunday -excluding Wednesdays that are our Flip Nights– and you get to drink free on the night that your name shows on our monthly calendar. 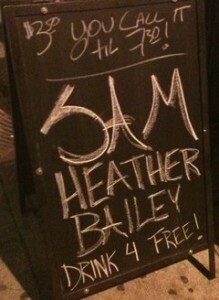 To participate, just come to our bar, order some drinks and write your name on our chalkboard. At the beginning of each month we will publish the names of the lucky winners that get to drink free at the hottest bar in Denver for one night. We also invite you to our Flip Nights on Wednesdays, where you have 50/50 chances to drink free, just order some drinks and flip a coin. When it is in the air call heads or tails, and if you win, your drinks are on the house! Name Nights are from Monday to Sunday, except on Wednesdays that are Flip Nights! So come join us, write your name on the chalkboard and wait for your name to be announced on our monthly calendar. Join us for our Flip Nights on Wednesdays, to have a 50/50 chance to drink free at The Front Porch. You can also friend us on Facebook and Google+, where we will post daily who drinks free on each night. And remember you can also join us for our Flip Nights on Wednesdays, to have a 50/50 chance to drink free. We are the hottest bar in town, where the drinks are cheap and the staff is friendly, see you tonight. Cheers!